Present your steps in diversified forms with polished pre-designed templates and examples, without wasting time and effort. Try Edraw and you will embrace a universe of possibilities. We need to share ideas about something step by step once in a while. Most people know to do it with arrows or lines. Have you considered doing it out of the box? Edraw process steps software enables you to display your steps in a wide range of creative layout styles. In this example, there are three groups of smart shapes combined beautifully together. They have already been designed with coordinating colors and related operation instruction right in the shapes. Each group's position can be changed by dragging it. You can put your subtitles in the diamond shapes. Add your description of each step in the rounded rectangles. Simplify Complex Process by Combining Linear Shapes and List Shapes. 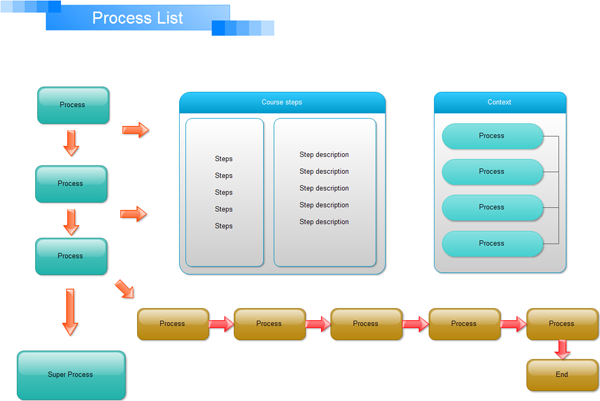 If a process includes many steps, listing them all in just a horizontal or a vertical line makes people feel aesthetically tired to look at it. Bending the steps into both vertical and horizontal lines can simplify it visually. The list shapes beside can be used to add related details so that your presentation can be smoother since you may forget some contents when you are nervous. 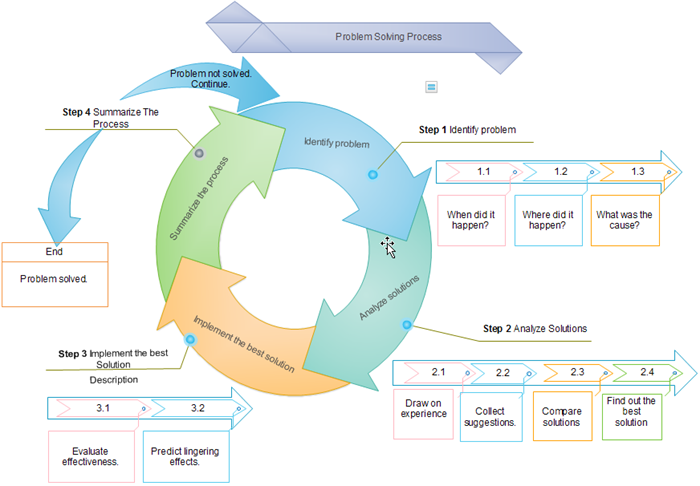 Some processes go round and round, in a cycle. To express this kind of processes, a circular shape is perfect. For example, after a problem is resolved, new problems rise again, then a new process of problem solving shall be begun again. The main steps can also be divided into smaller steps. There are some audiences who are more sensitive to numbers. 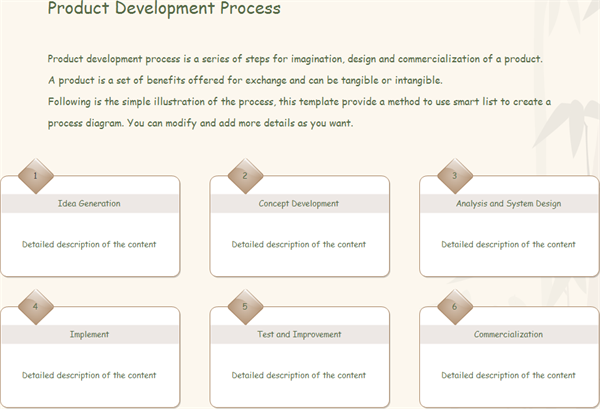 For instance, product development can be divided into 6 steps. These steps are displayed in the example from left to right in two rows, with each step numbered. 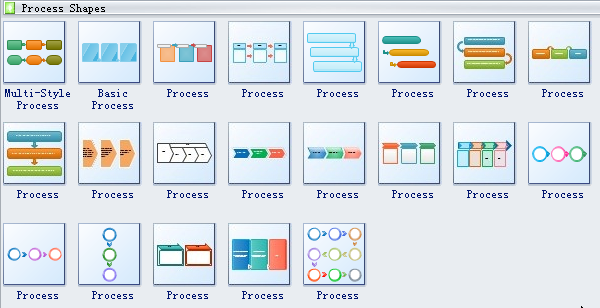 If your process contains more than 6 steps, you can lay them out in more rows by clicking Set Rows in the floating Menu and enter the row figure. 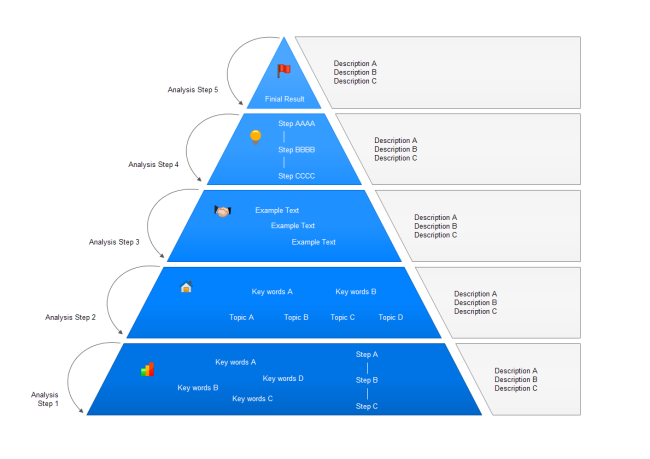 Pyramid shapes are optimal for showing top to down or bottom to top hierarchical process. We keep adding new resources every day so that users can have more and better drawing and presentation experiences. Your inspiration is at hand with Edraw. Combine, adjust, alter, embellish or enhance these templates to bring your presentation to the next level. Try more of them and get the most out of them. It is all up to you. 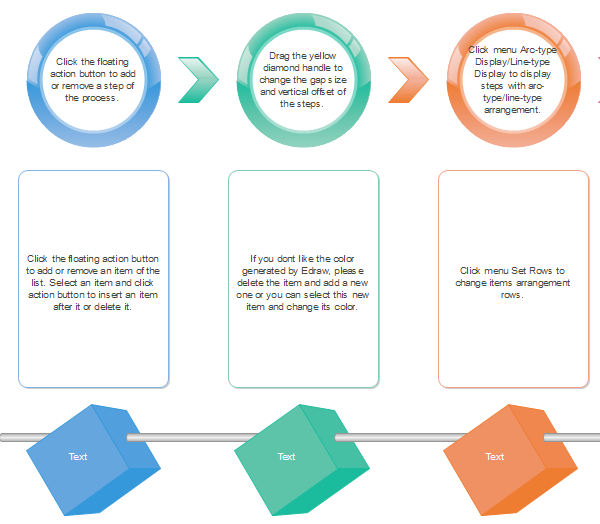 For more simple steps diagram templates, go to Show Steps Creatively.